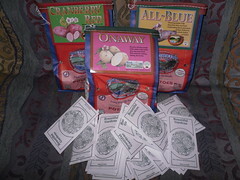 We got the first part of our seed order today, more than half of what we will be planting. I am so excited, too bad it is still cold and rainy, but I am sure the spring will be coming soon. There is still lots to do. We need to make our flats before we can start the seeds. (Tomatoes Feb.15, everything else March 1) Then while they are going we need to figure out for sure where we want the gardens, dig them and make some raised beds. We are doing a hybrid of in the ground and raised, because our soil is very poor (if we can afford all the supplies). Our Burpee seed order should arrive in a few days, and our live plant order will not be here until mid-march. We ordered some wonderful flowers and berries, for the rose garden in the back yard. I hope it is all looking lovely in time for the wedding.